Saskatoon is home to one of our two Grain Cleaning divisions. We sell grain cleaners, such as air and screen cleaners, clean to seed cleaners and dockage cleaners, seed treaters, along with color sorters, bucket elevators, drag conveyors, BoMill, and Kwik Kleens. We are western Canada's largest custom screen manufacturer. We also sell parts for various makes of grain cleaner and offer service for our equipment. The Saskatoon location is one of our largest dealerships. 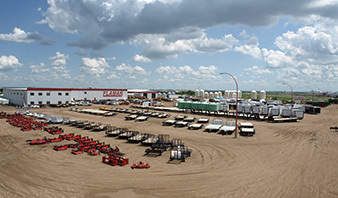 At the Saskatoon location we have a full line trailer division specializing in everything from utility trailers to Ag transport trailers. The Ag Division sells a wide assortment of agriculture equipment from livestock handling to field equipment and grain handling and storage. Our Rental division offers all the trailers onsite as rentals as well as agriculture equipment. We also offer a service shop to fully service your needs, whether it's a seed cleaner that needs new screens or other farm equipment that needs annual servicing. The Saskatoon location is home to our award winning marketing team, whom are extremely proud to be SABEX and ABEX winners. Flaman has become a leading supplier of Grain Cleaning equipment to Saskatchewan farms. We are located on the north side of highway #16 just on the West edge of Saskatoon. So come on down and see us, we've always got a pot of coffee and friendly knowledgeable staff, the kind you've come to expect from a company built on the honesty and respect of a family business.